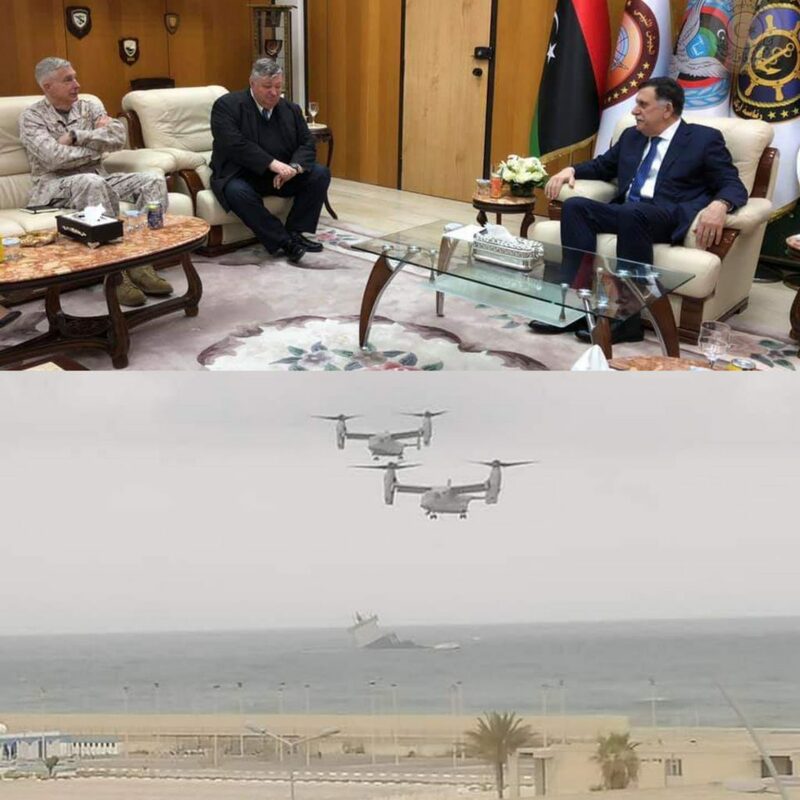 US acting-ambassador to Libya Peter Bodde and AFRICOM Commander General Tom Waldhauser descended on Tripoli in an official visit to Presidency Council and Government of National Accord head Faiez Serraj yesterday. The optics of the Americans’ dramatic arrival by helicopters at Tripoli’s Bu Sitta Naval Base attracted much more general public attention than any possible substance of their meeting. Bodde reported that he had had ‘‘productive meetings’’ with Sarraj, Minister of Interior Fathi Bashaga and senior Government of National Accord officials. He said that he had ‘‘reiterated United States support for Libya as a unified, secure, and prosperous state under a government that can serve the Libyan people. He had ‘‘stressed the importance of swiftly implementing comprehensive economic reforms, further stabilizing oil production and ensuring greater fiscal transparency of Libya’s economic institutions, including the Central Bank of Libya’’, and that the US would ‘‘not tolerate spoilers to the political process’’. He thanked Sarraj and Bashaga for Libya’s ‘‘strong partnership in combating ISIS and other UN-designated terrorist groups, and stressed the importance of avoiding further conflict that would enable terrorism and increase social and economic hardships’’. Bodde reported that the US had ‘‘pledged $500,000 USD in rapid-response non-lethal assistance in support of Ministry of Interior efforts to strengthen the capacity of the Tripoli Security Directorate. This new assistance complements the United States’ $30 million USD in ongoing security assistance in support of Government of National Accord priorities, including projects to provide training to the Tripoli Security Directorate, help implement international standards at key airports, improve Libya’s border security management capability, clear unexploded ordinance in Sirte, bolster security sector reform, and build coordination between relevant actors ahead of elections’’. Bodde added that ‘‘While these initiatives are critical to bolster security and address current threats, the only lasting solution for Libya is to overcome its political impasse’’. He expressed the US’s strong support of United Nations Special Representative of the Secretary-General Ghassan Salamé ‘‘as he works to facilitate dialogue, improve governance, and help Libyans prepare for credible and secure elections’’.